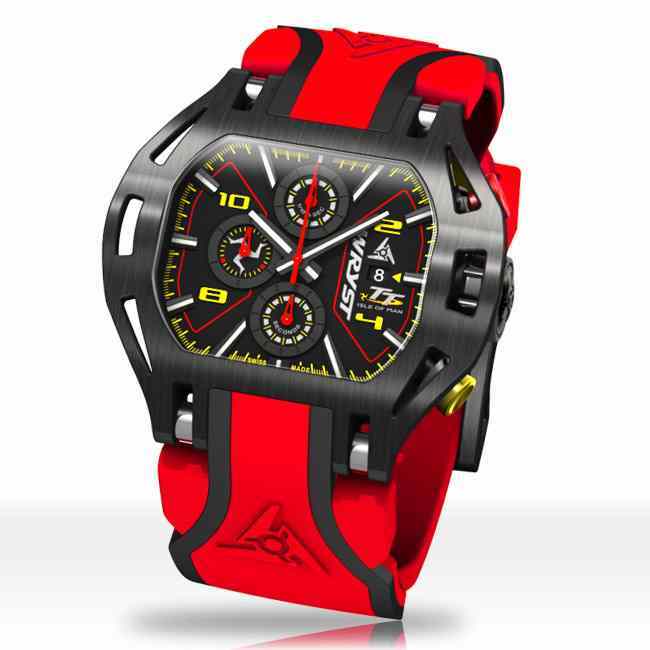 This red racing watch inspired by motorsports and racing has a bold manly feel. A tough chronograph watch for racers celebrating the world's fastest and most dangerous event: The Isle Man TT. Used in the making of racing engines, the luxurious red racing watch is protected by the hardest and most scratch-resistant coating, black Diamond-Like Carbon technology. Produced in limited quantities, this special edition still available for now is a stunning 50 mm size racing watch with a red 24mm width bracelet. 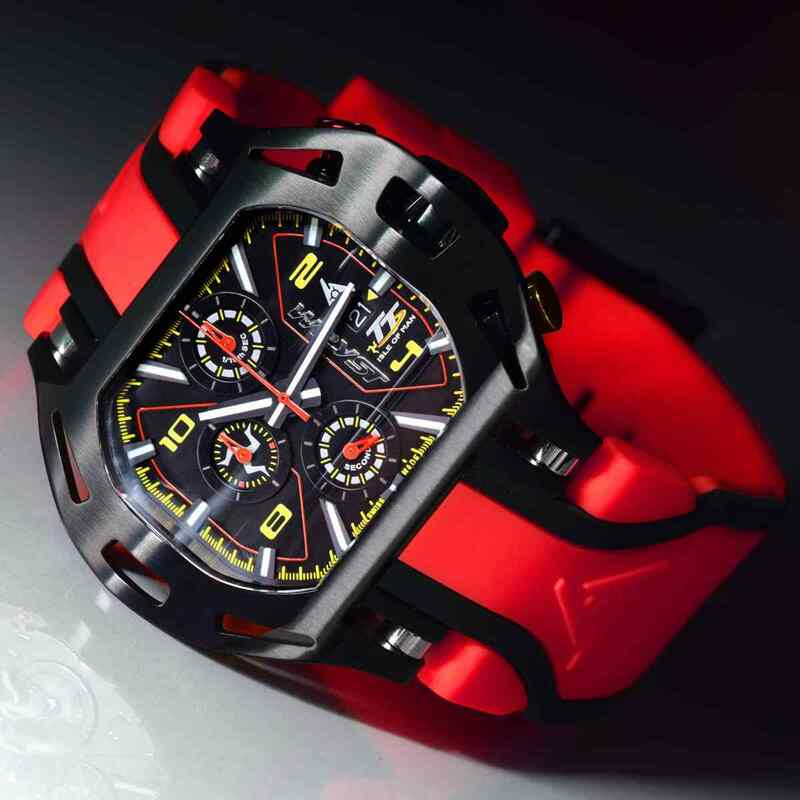 The red racing watch Wryst TT with black casing and aggressive style is for the bold. Any and every racer or pilot wants to wear a timepiece to match these thrilling and exalting sports. As tough as their vehicle, the black Diamond-Like Carbon protecting the casing is also used in the making of racing engines for its incredible hardness and toughness. Sapphire crystal and screw-down crown complement well the durable and reliable red racing watch. Either for pilots or riders, the remembrance of how fast the Isle of Man TT is add to the excitement of racing. Top start/stop red pusher, bottom yellow reset pusher, the chronograph is ready to time accurately any racing event. 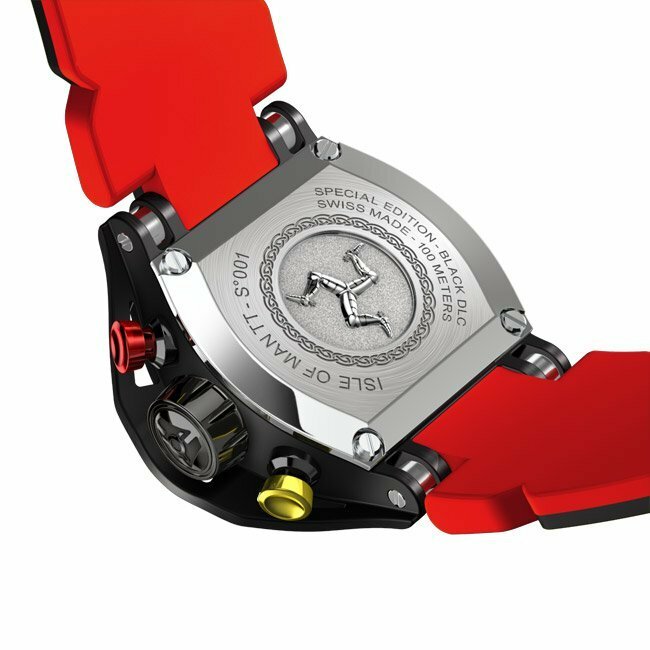 On the dial feature a remembrance of the Isle of Man Triskelion, emblematic logo of the Island. The sturdy curves of the casing are part of the signature design from Swiss watch brand Wryst. Black and red overall make this large 50 mm size watch a chunky companion fitting wrists measuring between 170 and 210 mm diameter. 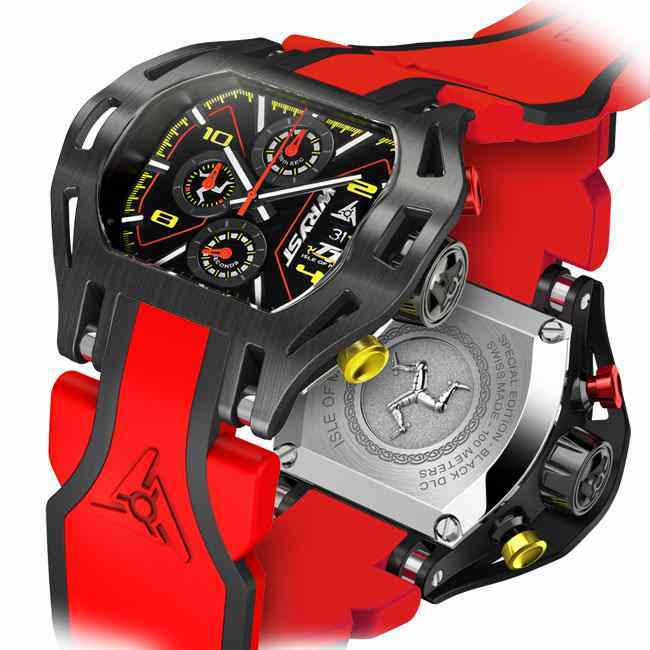 Moreover, launched in 2017 the red racing watch is only available it special edition, and stocks will not last forever. 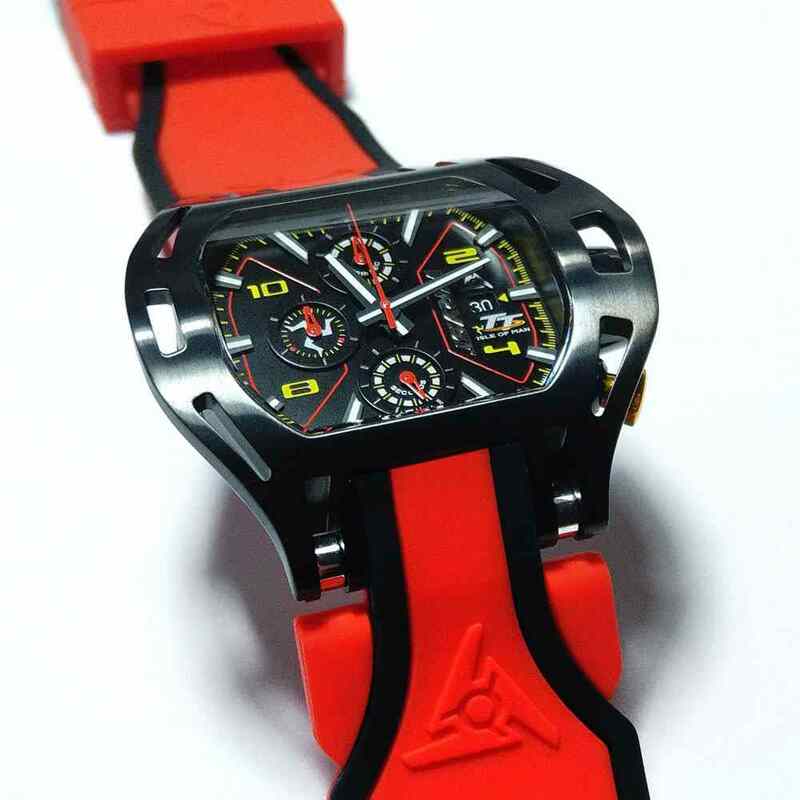 The Wryst TT red racing watch is also highly collectible. The previous smaller model produced from 2015 at 45 mm size only lasted a few months before becoming discontinued and sold out. 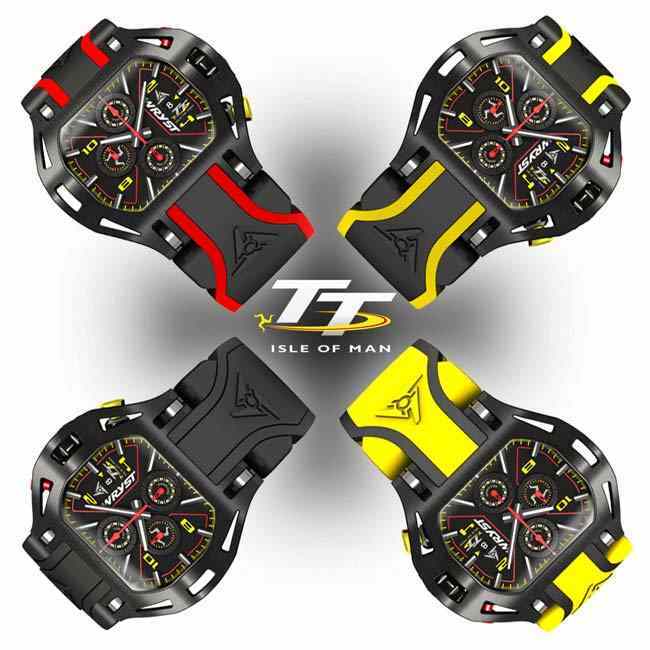 The perfect gift for TT races fans is now a stunning Swiss sports watches with aggressive sportive style and tough materials! 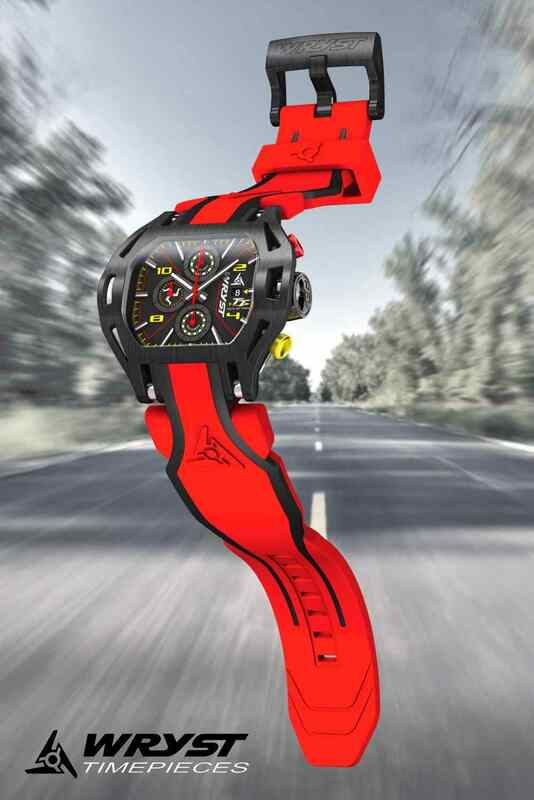 Take the jump and purchase this unique red racing watch for your spouse, partner or a member of a family before they will be unavailable.